Where in the world is your business or organization located? An easy, efficient and memorable way to make the location of your business or organization stand out and be noticed is through the use of vinyl window lettering. 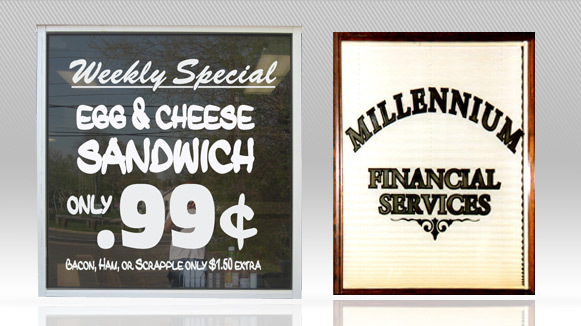 Seaboard Graphics can create custom window lettering that will make you easier to find – which is good for your business! You’ll be able to choose the colors and styles that best represent your business or organization. Whether you already have an idea of what you want your lettering to say, or if you need some help choosing the appropriate fonts and colors, Seaboard Graphics makes it easy for you. You’ll work with our talented team of graphic designers who can help create custom window lettering best suited to your business or organization. To find out how Seaboard Graphics can help create beautiful, customized window lettering for your establishment, call us at 800-721-1663 or fill out this convenient online form.